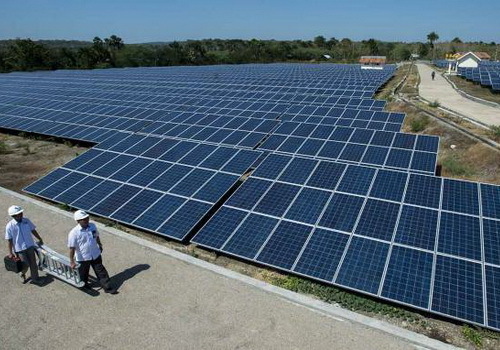 Indonesia prepares the installation of hundreds of thousands of solar panels in the islands nation. Indonesia's Minister of Energy and Mineral Resources, Ignatius Jonan, targets 255,250 solar panels installed on the outer, outermost and lagging islands by 2018. The minister said villages without electricity and poor quality electricity have been the focus of the government while meeting target of proportion of renewable energy. The government in the next two years is determined to upgrade the villages by optimizing the potential of local energy sources, including solar power plants and micro hydro power plants as mandated by President Joko Widodo. "Around 2.519 villages in Indonesia last 72 years have no electricity. The government targets to install solar panels in all houses in the village. In 2017 about 100,000 homes and by 2018 around 255,250 homes will have solar panels," said Jonan in a statement Saturday. Indonesia is the largest archipelagic country in the world and areas that do not have electricity are generally located in the outermost islands with the infrastructure left behind in it. To date the government has estimated that 11,000 villages have very bad electricity facilities. "Electrifying unspoiled villages requires great empathy, to share the taste with all the children of the nation.This electricity is civilization, the lack of electricity makes civilization move slowly," said Jonan. Under the administration of President Joko Widodo has moved very heavily to build infrastructure, including thousands of kilometers of roads, bridges and other public facilities. Renewable energy development is also part of the nation's commitment to meeting the Paris Agreement's targets.